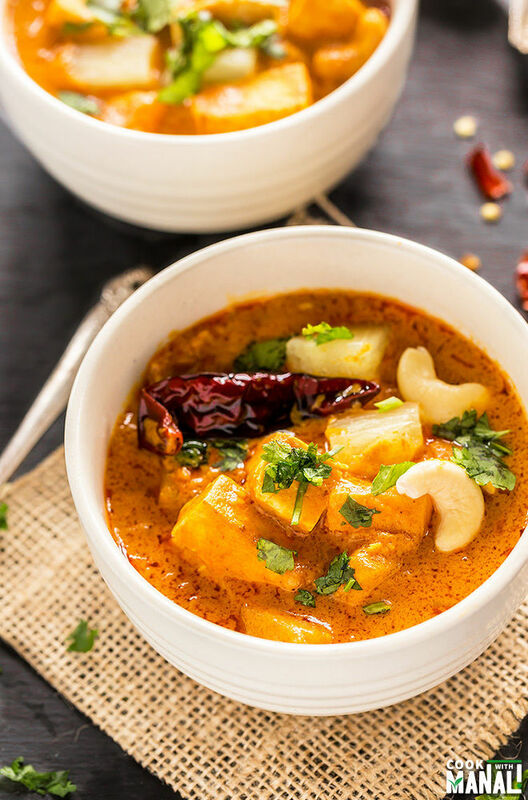 The next recipe in the Instant Pot series – Thai Peanut Tofu Pineapple Curry. 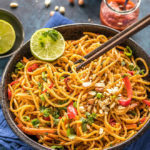 The recipe is vegan and all made in the instant pot! Raise your hands if you like thai flavors! Raise your hands if you like curry! 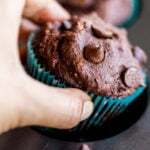 Well if both your hands went up, then you need to try this recipe. It’s really flavorful and the best part is that it comes together so quickly in the instant pot. My IP has been working overtime these days, so much so that I have “almost” ditched my traditional Indian pressure cooker. The concept of pressure cooker is deep rooted in Indian culture and cooking. We have been cooking our lentils, beans, rice in the pressure cooker since eternity. Have I told you guys my pressure cooker story? So this is one kitchen gadget which every Indian carries along when they leave India. Yes, we are almost handicapped without a pressure cooker in the kitchen. So what happened was when I was going to Scotland for masters, my mom packed my tiny pressure cooker in my carry on luggage. I didn’t even check my bag and mom thought such an important thing cannot be placed in the check in baggage! (of course!!) Well the cooker ended up being taken out at the airport security. I remember requesting them to let me take it since I was a student and going to a new country but they didn’t budge. I was so disappointed and then couldn’t cook anything there because a) I hardly knew any cooking! and b) without pressure cooker, whatever I knew was also a challenge. Mom dad ultimately couriered the cooker to me! Well now you understand the importance of a pressure cooker for an Indian! Moving on to this curry, the inspiration for this dish comes from a dish that I ate at a local Thai restaurant. The curry had cashews and pineapple and I really liked it. So I thought of adding some tofu, peanut butter and making it more wholesome! Here’s the thing with peanut butter in curries, it can get really overwhelming. For this recipe, I would suggest starting with 2 tablespoons of peanut butter. If you like a stronger flavor, you may add 2 tablespoons more. But don’t start with 4 tablespoons in the first place. 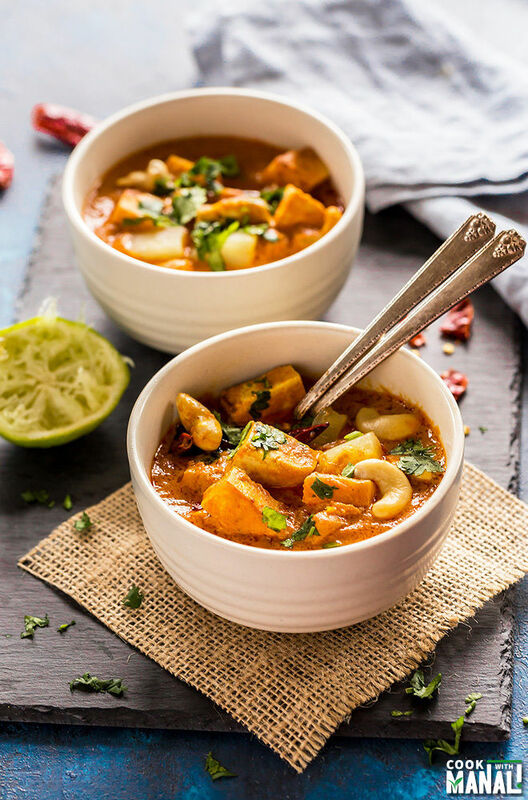 This thai peanut tofu pineapple curry is a sweet and spicy curry. You may adjust the flavors to taste. Prefer a spicier curry? Add more of the dried red chili, thai red curry paste and sriracha. Like a sweeter curry? Add more pineapple and coconut sugar! This instant pot recipe is vegan and can be made gluten-free by using tamari (gluten-free substitute for soy sauce). Now before someone says that the thai red curry paste has fish sauce so how come it’s vegan,? Well I use “Thai Kitchen” red curry paste and it’s completely vegan and easily available at most grocery stores and also on amazon. Hope you guys give this curry a try and if you do, please don’t forget to share feedback with me and tag #cookwithmanali on social media. PS: Thanks for all the feedback on the Instant Pot series! Because you guys really liked the idea of this series, I am going to continue doing it and also do videos, so stay tuned for that. Press saute mode on instant pot, once the pot heats up add olive oil. Break the dried red chili into two and add to the oil. Add onion and saute for a minute. Add cashews and saute till they start changing color. Add grated ginger and garlic and saute for a minute till you get nice aroma. Meanwhile in a bowl whisk together peanut butter, coconut milk, water and thai red curry paste. You might need to heat this mixture a little so that the peanut butter mixes completely. Add this mixture to the pot once ginger-garlic are fragrant. Give it a good stir. Then add soy sauce, rice vinegar, sriracha, coconut sugar and salt. Stir to combine. Now add cubed tofu pieces to the pot and mix. I used extra-firm tofu and pressed it with a hard object for 20 minutes prior to using it in the recipe. Cover the lid, cancel the saute mode. Press the manual button, adjust pressure to high and and cook on manual high pressure for 2 minutes. Quick release as soon as 2 minutes are up. Cancel “keep warm” mode and press the saute mode again. Add pineapple pieces and let it simmer for 1-2 minutes. You can adjust consistency of the curry at this point. Add water if it’s too thick for your liking. Squeeze in some fresh lime juice. 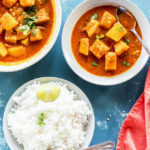 Garnish with cilantro and serve the thai peanut tofu pineapple curry with rice! 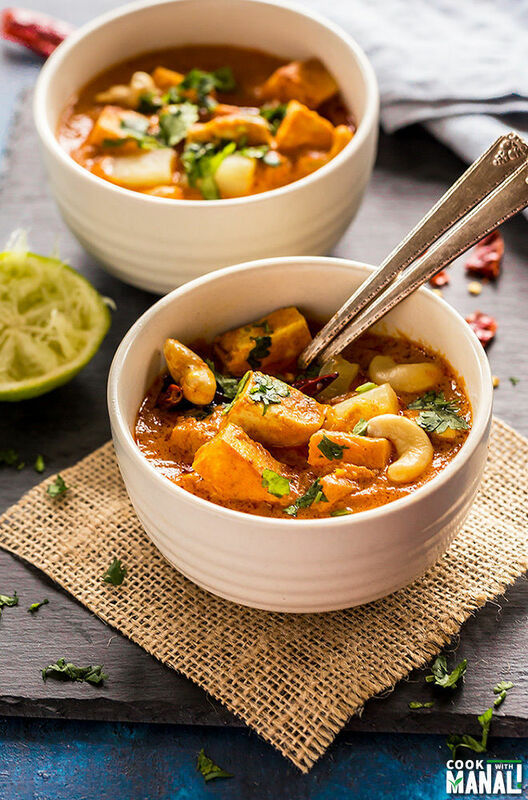 * Adjust the spice levels of this thai peanut tofu pineapple curry to taste. * I used canned pineapple here, if you use fresh pineapple, it might need some more time for cooking. 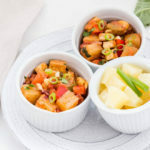 Vegan Thai Peanut Tofu & Pineapple Curry - all made in the Instant Pot! Then add soy sauce, rice vinegar, sriracha, coconut sugar, turmeric powder and salt. Stir to combine. Cancel "keep warm" mode and press the saute mode again. Add pineapple pieces and let it simmer for 1-2 minutes. You can adjust consistency of the curry at this point. Add water if it's too thick for your liking. This is like a vegetarian version of chicken curry. Love the add of pineapple in the curry, Manali. Thanks Angie, pineapple is my favorite! BOTH hands are raised because I love Thai and curry EVERYTHING! Naturally I am drooling over this! LOVE that it’s made with the ease of the Instant Pot and the flavors sound amazing! Cheers, girl! 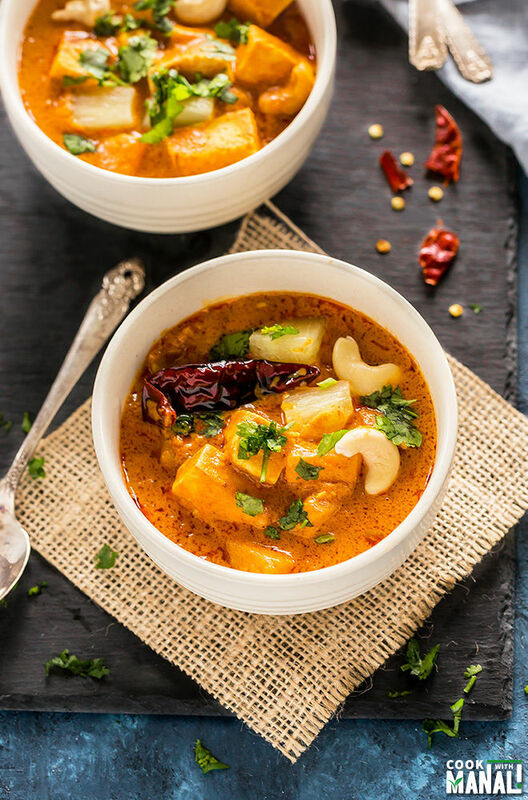 Absolutely love Thai flavors and loving this Thai peanut tofu pineapple curry, Manali. I haven’t used an instant pot yet, but I can tell I am going to need to add one to my kitchen appliances soon. They seem pretty amazing. This curry looks pretty amazing too! So pretty!!! Would love to try this! Could this be made easily on the stove top (I don’t have an instant pot)? What changes, if any, would u suggest for that? Of course! 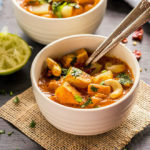 refer to this recipe https://www.cookwithmanali.com/vegetarian-thai-red-curry/ and proceed accordingly. 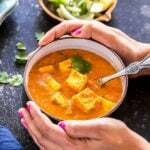 If you want you can pan fry the tofu before adding to the curry or simply end towards the end and simmer for 2-3 minutes. Hope this helps! 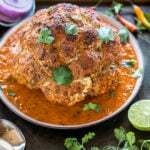 How long would it take to cook if I used chicken? I am not sure, I am a vegetarian so I have never cooked chicken! I put 1/2″ cubes of potatoes in and they were totally cooked in the 2 minutes. How would you adjust cooking time/order of ingredients if you added vegetables like carrots or potatoes? Thanks! Looks great! How many 14oz blocks of tofu is this? How would you adjust the recipe if I’m going to cook 2 blocks? Hi Samantha, this wasn’t even one 14 oz blok of tofu..one 14oz block of tofu has 396 grams and I have used only 200 grams of tofu here . So I have used half of the 14 oz block..If you are cooking 2 block means you will have to quadruple/4 times this recipe! Not sure how that would work! I have been doubling the recipe and it works perfectly in my 8 qt. Next time you list weights/volumes would you do it in oz, cups/ml and oz lbs./grams. Do not know who your target audience is but your fans in the US would appreciate this. Have just eaten and am reviewing your recipes and am drooling. Get out the hankies. Thank you for the encouragement for a beef eater to look closer at the joys of vegetarianism. You are a life saver. Hi Jerome! Thanks for appreciating my work, I am trying to include measurements in ml and grams in more and more of my recipes. I hope that helps and I hope you enjoy some of the recipes here! Could you use brown sugar instead of coconut sugar? I cannot find small bags of coconut sugar, so I don’t want to buy a ton of it. Thanks! of course why not, brown sugar will work well! What would you suggest using in place of the cashews? I am allergic to tree nuts but want a full flavored meal. Would this still taste good without the cashews? It would still be good without cashews, use other veggies if you want like peppers, carrots etc. Do you have the nutritional values for these please? Hi! This looks fantastic, however could I make this in my slow cooker instead? If so, do you know about how long I would set it for? No idea sorry, have never made this in the slow cooker..
Amazing! So delicious, our whole family gobbled this up and requested it move into regular rotation. Super easy too! Thanks so much. I am glad to hear that Neil! Could you use crispy tofu for this dish? Yo…you should put rice in the ingredients list! It’s a bit of a bummer to get to the bottom and realize you didn’t buy rice, which is snuck into the last step in the instructions, but not the ingredients! 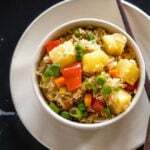 rice is a serving option and not an ingredient for this recipe..the recipe is for Thai Peanut tofu Pineapple Curry and there’s no rice in it. I served it with rice, one may serve with any grain they want. So I am not sure why rice should be a part of ingredient list..
Have you tried making this in a slow cooker? What would you suggest substituting for dried chilis? They aren’t available at my local store.